DONETSK, Ukraine -- On the last day of May, a surface-to-air rocket was signed out of a military base near Moscow where it had been stored for more than 20 years. Pro-Russian rebels in Donetsk, Ukraine. According to the ornate Cyrillic handwriting in the weapon's Russian Defence Ministry logbook, seen by Reuters, the portable rocket, for use with an Igla rocket launcher, was destined for a base in Rostov, some 50 km (31 miles) from the Ukrainian border. In that area, say U.S. officials, lies a camp for training Ukrainian separatist fighters. Three weeks later the rocket and its logbook turned up in eastern Ukraine, where government troops seized them from pro-Russian separatists. The logbook, which is more than 20 pages long, records that rocket 03181 entered service on May 21, 1993, and had regular tests as recently as 2005 to make sure it was in fighting form. The seal of the Russian Defence Ministry has been stamped over the signature sending the weapon to Rostov. A copy of the log was passed to a diplomat in Ukraine’s capital, Kiev. Reuters was unable to verify its authenticity with the Russian military, and Moscow has consistently denied arming the separatists in eastern Ukraine. The Igla and its logbook are just one indication that weapons are flowing from Russia into Ukraine. Interviews with American officials, diplomats in Kiev, and Russian military analysts paint a picture of a steady and ongoing flow. These people say weapons – from small arms to armored personnel carriers, tanks and sophisticated missile systems – have flooded into the region since May, fueling the violence. In an interview with Reuters last week, a separatist leader said that Russia may have supplied the separatists with BUK rockets, which were used to shoot down Malaysia Airlines flight MH17. The destruction of the civilian passenger plane over eastern Ukraine on July 17 killed nearly 300 people. Alexander Khodakovsky, commander of the Vostok Battalion, told Reuters: "I knew that a BUK came from Luhansk (in east Ukraine) ... I heard about it. I think they sent it back. Because I found out about it at exactly the moment that I found out that this tragedy (of MH17) had taken place. They probably sent it back in order to remove proof of its presence." 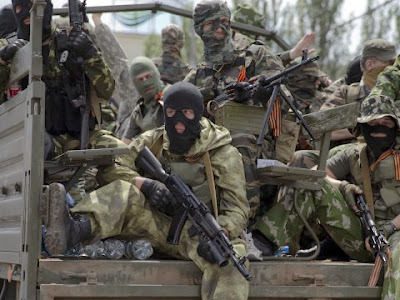 Three U.S. government officials said the weapons flow from Russia increased dramatically several weeks ago in response to successes by Ukrainian government forces, including the recapture of Slavyansk, a separatist stronghold in eastern Ukraine. The new shipments included anti-aircraft systems designed to combat Ukraine’s air power, those officials said. “If you trace the increase in supplies and materials ... we’ve seen in the last few weeks culminating in this tragic incident, it’s clearly in the face of successes by the Ukrainian forces," said a senior U.S. official, who like the others spoke on condition of anonymity. Moscow, which has said it is willing to cooperate with an international investigation into the loss of MH17, has denied sending any BUK missiles to the rebels. It has said Washington is attempting to destabilize Russia through events in Ukraine. Russian Foreign Minister Sergei Lavrov said this week that Moscow was hopeful that monitors from the Organization for Security and Cooperation in Europe could be deployed along Russia's border with Ukraine to dispel suspicions that Russia is aiding the rebels. "We hope that this will dispel suspicions that are regularly being voiced against us, that those (border) checkpoints controlled by the militias from the Ukrainian side are used for massive troops and weaponry deployment from Russia to Ukraine," he said. Pro-Russian separatists in Ukraine maintain most of their weapons have come from captured Ukrainian armories or have been seized directly from the Ukrainian military on the battlefield. In the weeks following Russia's annexation of Crimea in March, tensions grew on the south and east frontiers of Ukraine. Kiev's border guard agency said it stopped thousands of Russian citizens who tried to enter Ukrainian territory carrying weapons or bags full of camouflage. Separatists started firing on border guard positions, according to Ukrainian officials. On May 29, the Stanychno-Luhanske border guard division in Ukraine's Luhansk province was attacked by 300 gunmen with small arms and grenade launchers. Rebels seized control of the facility after five days of fighting. Other border guard divisions and checkpoints along Ukraine’s more than 2,000-km (1,243-mi) border with Russia also fell. Separatists were able to ferry in people and equipment almost unhindered. That led to more ambitious attacks on Ukrainian targets. On June 14, for instance, separatists shot down a Ukrainian IL-76 military transport jet coming in to land near the eastern city of Luhansk. All 49 people on board died; charred pieces of the fuselage and engines littered the rolling wheat fields outside the village of Novohannivka. The weapon used that day, according to separatists who later spoke about the attack, was an Igla rocket launcher, sometimes known generically as a MANPAD, for man-portable air-defence system. The origin of the weapon remains unclear. There is no evidence this was connected to the Igla rocket seized by Ukrainian forces a week later along with its log book. Iglas were used extensively in Afghanistan, Chechnya and Bosnia in the 1990s and are easy to transport and common in eastern Ukraine. Videos, posted online after Ukrainian troops drove separatists out of Slavyansk on July 7, show boxes marked 9M39 – the model of missile used with an Igla – stacked in the basement of the mayor’s office. The day after the IL-76 was shot down, Valery Bolotov, top commander of the Luhansk People's Republic, claimed responsibility. “I can't tell you anything more detailed on the IL-76, but I will repeat that the IL-76 was hit by our militia, the air defense forces of the Luhansk People's Republic," Bolotov, who wore a camouflage T-shirt, said in a video posted on YouTube. The commander said that separatists in Luhansk controlled nearly 80 km (50 mi) of the border from Dolzhanksy to Izvaryna at that time, but denied getting weapons from Moscow, saying they had been pillaged from Ukrainian army and police store rooms. A separatist officer in Slavyansk who used the nom de guerre Anton also said the Igla in the IL-76 attack was not Russian but a weapon seized from Ukrainians. He declined to say whether the separatists received other weapons from Russia. Alexander Gureyev, a Russia supporter from Luhansk, told Reuters last week that all the separatists’ weapons had been found in local arms warehouses. "We had to boost our arsenal,” he said. He declined to detail the origin of heavy weapons, but said separatists were “thrilled” when the IL-76 was shot down. He said the Luhansk rebels had decided to station anti-aircraft sharpshooters at the nearby airfield in retribution for the deaths of at least eight people in what he called a Ukrainian airstrike on the rebels’ headquarters in Luhansk. "They simply flew above us, we were already fed up with it all and decided that we would start shooting at everything,” he said. “We simply took anything out of the sky that flew above us." Not everyone believes the separatists’ assertions that their weapons had been seized from Ukrainian troops. A diplomat said that arms had started to come in from Russia regularly around the time of the independence vote in Crimea in May. In the past couple of weeks an increasing amount of materiel had arrived “in reaction to the collapse of Slavyansk,” he said. That included T64 tanks from stocks of old weapons discarded after the collapse of the Soviet Union. He said pro-Russian separatists have been found in possession of a Kamaz Mustang military transport vehicle that is not used in Ukraine and cannot be bought there. Reuters could not independently verify that. “There was a serious escalation in the middle of June, when heavy weapons began to appear among the separatists, including tanks and artillery in such quantities that it would be hard to attribute it to seizures from Ukrainian stockpiles." Another independent Russian military analyst, Alexander Golts, also said the rebels had received arms from Russia. He said rocket launchers were spotted in April or the beginning of May very early in the conflict. Washington is in no doubt Russia is the source of many of the weapons. At least 20 tanks and armored personnel carriers have crossed the border from Russia since the downing of Malaysia Airlines MH17, a senior U.S. intelligence official said. In a media briefing on July 22, U.S. intelligence officials also released satellite photographs of what they said was a training site for Ukrainian separatists near the Russian city of Rostov. The photographs appear to show increased activity at the site between June 19 and July 21. A Moscovite volunteer called Valery Kolotsei, 37, said he joined the rebels in Ukraine’s Luhansk region for a few weeks in May and June. He said he had connected with other volunteers over Vkontakte, Russia’s version of Facebook. They had gathered, he said, in the Rostov region, where U.S. officials say a camp for training Ukrainian separatist fighters sits. Kolotsei said the rebel group he joined used a motley array of weapons, including a mortar produced in 1944. Before the MH17 incident, U.S. spy agencies issued multiple warnings that Russia was shipping heavy weaponry, including rockets, to Ukrainian separatists, U.S. security officials said. The officials said that before MH-17 went down, the United States had become aware separatists possessed SA-11 BUK missiles, but believed they were all inoperable. Officials acknowledged, too, that U.S. intelligence agencies do not know who fired the missile or when and how separatists may have obtained it. Russian President Vladimir Putin has firmly denied his country had any involvement in the fate of MH17. Putin and the separatists blamed Ukraine for the disaster, with some suggesting a Ukrainian missile team brought down the passenger aircraft. The rebels have no aircraft, he said. Despite the MH17 tragedy, the conflict shows little sign of diminishing. He said some rebels fear the fighting has "gotten out of control." Olexander Motsyk, Ukraine’s ambassador to the United States, told Reuters in an interview that his country has evidence Russia is preparing to supply separatist rebels with a powerful new multiple-rocket system known as the Tornado. According to military websites, the system first saw service earlier this decade and is an improvement on Russia’s older Grad missile launcher. The evidence for this, Motsyk said, includes satellite photographs as well as intercepts of telephone conversations.